Designing ads that are not only informative but also eye-catchy is a desirable trait for marketers. Likewise, the platform where these ads are placed help determine the effectiveness of the campaign in influencing customers. Nowadays, social media is an exciting pool of potential consumers that marketers can target to showcase their brand. Since the launch of Instagram Stories in 2016, it has become one of the most popular content sharing feature across platforms, with more than 300 million daily users. Social marketers can also leverage Instagram Stories to reach out to more people and build their brand loyalty. 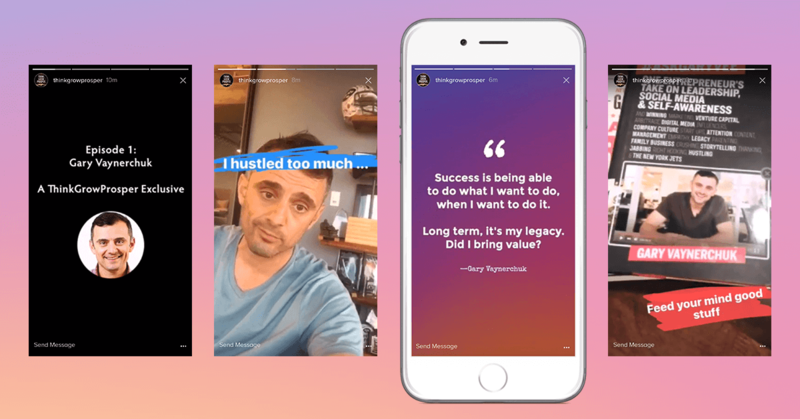 In this blog post, we take a closer look at three exciting ways your business can benefit from Instagram stories. Take a look. According to reports, the launch of Instagram Stories has influenced users to visit the platform more frequently and spend more time than before. Among the audiences, those aging under 25 years tend to spend more than half an hour daily on Instagram. Likewise, users aging more than 25 years generally spend more than 24 minutes daily on this platform. Being a marketer, therefore, it is important that you target audiences with content that is both brief and engaging. You would want to promote stories that depict your product and services, and also influence your target audience to visit your website. While Instagram Takeovers are quick, easy and exceptionally engaging, they can also help social marketers to increase their following. You can utilize takeovers to build a mutually benefiting relationship with an influencer (for a 24-hour period). Subsequently, you can leverage this bond to expand your audience and engage them with interesting updates. For your business, you can ask your partner to swap stories or promote “a day in the life” story of any employee. Either way, users will keep coming to your stories. In October 2017, Instagram added a feature to Instagram Stories that allows users to put up interactive polls to their Stories. These polls are both fun and a seamless way to engage the audience. Moreover, these polls also can help gain valuable customer insights on any topic. According to the recent market survey, both influencers and brands have seen a significant increase in their Instagram Live and Stories engagement by incorporating interactive polls. Likewise, you can also track user engagement per post or an entire feed activity for a particular time period. All you have to do is use Instagram Insights, that’s all! In January 2017, Instagram did launch a Stories Ads featuring prominent brands such as Nike, Airbnb, and Netflix. By March same year, this feature was opened to all small and large business establishments. Being a marketer, you must remember to make the ad both engaging and unique to catch the audience’s eyes. That said, you only have 10 seconds in case of photo ads and 15 seconds for video ads to showcase your product. Therefore, make sure to design an ad that delivers the message in the first few seconds, and is interesting enough for the users to take immediate action after viewing. If you are designing a photo ad, you could use bright, bold photographs bearing a clear brand image and a simple message. This will allow users to learn about your brand in time before the ad runs out. Instagram Stories are perhaps quite new among other social media platforms. That said, there’s no better time than now to leverage on all capabilities these stories have to offer. To conclude, why not create some Instagram Stories and put them up on your social media account. This marketing strategy would certainly give a huge impetus to your business.